In two previous alerts, SafeMedicationUse.ca has alerted consumers about the risk of painful eye injuries if Clear Care contact lens cleaning solution is used incorrectly. Unfortunately, we continue to receive reports from consumers who have experienced eye injuries after mistaking Clear Care solution for a multi-purpose contact lens cleaning solution. 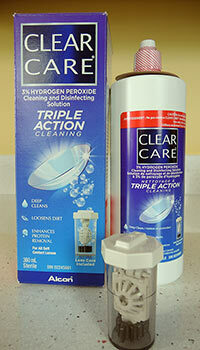 Clear Care solution contains 3% hydrogen peroxide. The solution should not be used directly in the eye or as a rinsing solution for lenses. Instead, it must be used with a special lens case that neutralizes the hydrogen peroxide. The solution and the lenses must remain in the special case for at least six hours. During this soaking time, the hydrogen peroxide is neutralized to a solution that is safe for the eyes. In all of the incidents reported to SafeMedicationUse.ca, the consumers experienced pain and burning when Clear Care solution that was not neutralized came into direct contact with their eyes. (See Figure 1, showing a photo of a consumer's eye after an injury with Clear Care.) In some cases, the consumers soaked their contact lenses in Clear Care solution using a flat lens case instead of the special case. In other cases, the consumers used Clear Care solution that had not been neutralized to quickly rinse their lenses and then placed the lenses directly into their eyes. In April 2013, an advisory from Health Canada warned of the risk of eye injury when contact lens cleaning solutions containing 3% hydrogen peroxide are used improperly. Health Canada asked manufacturers to update the labels of Canadian products to highlight the risks of improper use. Since then, the company has added warnings to the outer and inner labels of the Clear Care product (Figure 2 and Figure 3). However, the most recent incident occurred despite this new labelling. In that case, a consumer purchased Clear Care and used the solution to rinse a contact lens. The consumer then placed the lens into her eye and experienced severe pain. An eye doctor later confirmed that she had a corneal burn. The consumer reported that she picked up the product in an area of the store where she had previously found a multi-purpose solution. The consumer also described problems with the labelling. She reported that the warning on the outer package was not readily visible and the warning on the bottle was displayed in very small print. SafeMedicationUse.ca has contacted the manufacturer with information about the reported incidents. Do not assume that all contact lens solutions are the same! Check package labels and inserts carefully before purchasing or using any contact lens product. Before you remove your contact lenses for cleaning or rinsing, carefully read the instructions for the product you have selected. If you are using Clear Care solution, always use the lens case provided with the product. Ensure that your contact lenses remain in the case for the recommended soaking time. To avoid mix-ups at home, keep lens cleaning solutions containing hydrogen peroxide in a location separate from where you keep solutions used to rinse or moisturize your lenses. If you know about other incidents like these ones, please tell us about them by submitting a report. Do not display hydrogen peroxide–based contact lens cleaning solutions beside multi-purpose solutions. In community pharmacies, consider storing hydrogen peroxide–based solutions behind the counter. Before selling or recommending hydrogen peroxide–based contact lens cleaning solutions, confirm the intended use of the product and educate consumers about proper use. Share this SafeMedicationUse.ca alert with consumers and patients. Consider posting a copy of the alert near displays of hydrogen peroxide–based lens cleaning solutions.